In patients presenting with acute liver failure (ALF) prediction of prognosis is vital to determine the need of transplantation. Based on the evidence that plasma disappearance rate of indocyanine green (ICG-PDR) correlates with liver cell function, we evaluated the ability of ICG-PDR measured by pulse dye densitometry to predict outcome in patients with acute liver failure. Prospectively markers of hepatocellular injury, synthesis and excretion, including ICG-PDR were measured daily until liver transplantation, death, discharge from intensive care unit, or up to 7 days in 25 patients with acute liver failure. Receiver operating curve (ROC) analysis was performed to assess the value of ICG-PDR to predict outcome in ALF. The 25 patients analyzed included 18 that recovered spontaneously and 7 that underwent liver transplantation (n = 6) or died (n = 1). Causes of ALF included viral hepatitis (n = 4), toxic liver injury (n = 15), ischemic liver injury (n = 2), and cryptogenic liver failure (n = 4). King's college criteria were fulfilled in 85.7% of patients not recovering spontaneously and in 16.7% of patients recovering spontaneously. The mean ICG-PDR measured on day 1 in patients recovering spontaneously was 12.0 ± 7.8%/min and in patients not recovering spontaneously 4.3 ± 2.0%/min (P = 0.002). By ROC analysis the sensitivity and specificity of an ICG-PDR value ≤ 6.3%/min on study day 1 were 85.7% and 88.9%, respectively, for predicting a non spontaneous outcome in ALF. ICG-PDR allows early and sensitive bedside assessment of liver dysfunction in ALF. Measurement of ICG-PDR might be helpful in predicting the outcome in acute liver failure. Acute liver failure (ALF) is a rare condition in which rapid deterioration of liver function occurs in previously healthy individuals. The most prominent causes include drug-induced liver injury, viral or autoimmune hepatitis, Wilson disease, ischemia, or unknown reasons . The most widely accepted definition of ALF includes evidence of coagulopathy, usually an INR ≥ 1.5, and any degree of encephalopathy in a patient without pre-existing liver disease and with an illness of <26 weeks duration . Liver transplantation is the treatment of choice, but because this is only clearly justifiable in patients who would otherwise die, criteria for determining such patients have been established. Prognostic scoring systems still fail to achieve success, given the wide variety of aetiologies that lead to this end stage syndrome. The decision as to whether a patient will recover with conservative management or require transplantation has been the subject of many different reports and case series; however, the King's College Criteria remain the current standard for many clinicians . Indocyanine green (ICG) is a water-soluble, inert anionic compound. After intravenous injection it mainly binds to albumin and β-lipoproteins in the plasma. ICG is not metabolized and is almost completely excreted into the bile without enterohepatic recirculation . Because of these features, ICG has been studied in assessing liver function before hepatectomy, in liver transplantation donors and recipients, in patients with chronic liver failure, and in critically ill patients as a prognostic factor [5–11]. Plasma disappearance rate of ICG (ICG-PDR) is the most commonly used ICG-derived parameter for clinical and experimental assessment of liver function and should physiologically be >18%/min . ICG-PDR depends on ICG uptake by hepatocytes, its excretion into the bile, blood flow-dependent liver metabolism, and energy status. It does not represent the liver blood flow alone. There are various techniques to assess ICG-PDR in vivo. The gold standard relies on serial blood sampling after ICG injection with spectrophotometric analysis of concentration [9, 10]. However, this method is invasive, expensive and time-consuming. In contrast, a non-invasive pulsedensitometric method uses a transcutaneous system adapted from pulse oxymetry and a peripheral or central venous access for ICG injection. This method correlates well with the invasive method in hemodynamically stable and mechanically ventilated critically ill patients as well as hemodynamic unstable patients undergoing liver transplantation [13, 14]. Using ICG-PDR we measured residual liver function in patients with acute liver failure non-invasively. We evaluated the relationship between ICG-PDR and non-spontaneous recovery, to serve as a diagnostic marker to identify candidates who have to be transplanted. We then assessed the usefulness of this test by examining the correlations between the results of ICG-PDR and other markers of liver function. From 01/2006 to 02/2007, 25 consecutive patients who presented at the University Hospital of Heidelberg with acute liver failure were prospectively enrolled in this study after obtaining informed consent. The study protocol was approved by the ethics committee of the University of Heidelberg. King's College Hospital criteria and model of end-stage liver disease score were determined as previously defined [3, 15]. The main demographic and clinical features of the patients are summarized in Table 1. *Statistical significance of differences between ALF patients with and without spontanous recovery. Abbreviations: INR, international normalized ratio; MELD, model for end-stage liver disease; KCH, King's College Hospital; and SD, standard deviation. The clinical management of the patients and the decision of whether to transplant a patient were solely left to the attending physicians discretion blinded to the ICG-PDR measurements. The decision of the attending staff to list a patient for transplantation was based on critical evaluation of performance in clinical scores, the patients general condition and comorbidities as well as careful interpretation of the clinical course. Pulse dye densitometry was performed using a non-invasive densitometer (LiMON Leberfunktionsmonitor, Pulsion Medical Systems AG, Munich, Germany) by one medical student. The instrument measured arterial ICG concentration based on the principle of differences in absorbance between oxyhaemoglobin and ICG (wavelengths, 905 nm and 805 nm, respectively). This procedure is similar to the concept of pulse oximetry, in which arterial oxygen saturation represents the difference in adsorbance between oxyhaemoglobin and reduced haemoglobin (wavelengths 940 nm and 660 nm, respectively). In principle, the ICG-PDR is determined by monoexponential transformation of the original ICG concentration curve, backward extrapolation to the time point 'zero' (100%), and describing the decay as percentage change per time. Taking blood samples is not necessary. Directly after inclusion in the study a bolus of 25 mg of ICG (ICG-Pulsion, Pulsion Medical AG, München. Germany) was injected through an intravenous catheter, followed immediately by flushing with physiological saline. Blood ICG concentrations are monitored at every pulse via an optical probe attached to the patient's finger. ICG-PDR means the change of ICG concentration over time (in percent per minute) and reflects the amount of the dye which is eliminated in percent of the initial value. It is automatically calculated by drawing the decay curve of ICG density. After inclusion in the study ICG-PDR was determined daily until death, liver transplantation, or discharge from intensive care unit for up to 7 days. During the study no adverse events attributable to ICG application were noted. Blood samples were taken daily during the study to assess serum concentrations of the following liver function tests and markers for disease severity/liver injury: aspartate aminotransferase (AST), alanine aminotransferase (ALT), bilirubin, creatinine, cholinesterase, albumin, INR. The Mann-Whitney U test was used to examine differences in laboratory test results, ICG-PDR values, Apache II scores, and MELD scores between 2 groups and the Kruskal Wallis test to examine differences between more than 2 groups. For the measures of diagnostic accuracy 95% confidence intervals are reported. Correlations between ICG and results of other laboratory tests and scores were determined using Pearson's correlation coefficient. P values less than 0.05 were considered statistically significant. The study group included 19 women and 6 men with a mean age of 42.1 years (range: 18 - 80 years). Causes of ALF included viral hepatitis (n = 4), toxic liver injury (n = 15), ischemic liver injury (n = 2), and cryptogenic liver failure (n = 4). ALF patients with toxic liver injury included four patients with acetaminophen (AAP) and 11 patients with other drug or Amanita mushroom poisoning (non-acetaminophen, NAAP). The total of 25 patients included 18 that recovered spontaneously and 7 that underwent liver transplantation (n = 6) or died (n = 1). Among the different causes, patient numbers with versus without spontaneous recovery were: viral hepatitis (2/2), AAP (4/0), NAAP (8/3), ischemic (1/1), and cryptogenic liver failure (3/1). The laboratory data on admission showed that the patients that recovered spontaneously had a significantly lower INR (1.9 ± 0.4 vs. 3.9 ± 1.6, P < 0.001). Bilirubin and creatinine in serum were both higher in patients that did not recover spontaneously, although the difference was not significant (Table 1). The MELD score on admission was significantly higher in the patients that did not recover spontaneously (33.4 ± 3.7 vs. 18.8 ± 4.8, P < 0.001). King's college criteria were fulfilled in 6 of 7 patients not recovering spontaneously and negative in 15 of 18 patients recovering spontaneously, resulting in a sensitivity of 85.7% and a specificity of 83.3%. ICG-PDR was measured daily in each patient from admission for seven consecutive days. Measurements were terminated earlier in patients that were liver transplanted, died, or were discharged from intensive care unit. In all of the patients, the first ICG-PDR measurement was made within 24 h after admission to the intensive care unit. The course of ICG-PDR values for each ALF patient is displayed in Figure 1A for patients recovering spontaneously and in Figure 1B for patients that did not recover spontaneously. Time course of indocyanine green plasma disappearance rate (ICG-PDR) in ALF patients with (A) spontaneous recovery (n = 18) and (B) no spontaneous recovery (n = 7). ICG-PDR was obtained daily during the study (day 1 to 7 or until liver transplantation, death, or discharge from intensive care unit). The ICG-PDR measured at day 1 was significantly lower in patients not recovering spontaneously than in spontaneously recovering patients (mean, 4.3 ± 2.0%/min; median 13.0; vs. mean, 12.0 ± 7.8%/min; median 4.2, respectively (P = 0.002)) (Figure 2A). The lowest ICG-PDR measured in each individual during the study was also significantly lower in patients not recovering spontaneously than in spontaneously recovering patients (mean, 3.4 ± 1.5%/min; median 6.9; vs. mean, 9.4 ± 7.3%/min, median, 3.2, respectively (P = 0.018)) (Figure 2B). There was no statistically significant difference between the ICG-PDR measured at day 1 and the lowest ICG-PDR measured in each individual patient. When comparing patients' ICG-PDR with respect to the aetiology of ALF no statistically significant differences between the 5 groups could be detected. This was true for ICG-PDR at day 1 and for the lowest ICG-PDR measured in each individual (Figures 2C and 2D). Indocyanine green plasma disappearance rate (ICG-PDR) in patients with acute liver failure. Distribution of data presented as a box and whisker plots: 25th percentile, median, 75th percentile, maximum, and outliers (circles). The bold asterisk indicates statistical significance (Mann-Whitney U test). (A) ICG-PDR measured on day 1 in patients with ALF that recovered spontaneously (SR) or did not recover spontaneously (NSR). ICG-PDR is significantly lower in patients that did not recover spontaneously than in patients that recovered spontaneously (P = 0.002). (B) Lowest ICG-PDR measured throughout the study (day 1-7) in patients with ALF that recovered spontaneously (SR) or did not recover spontaneously (NSR). ICG-PDR is significantly lower in patients that did not recover spontaneously than in patients that recovered spontaneously (P = 0.018). (C) ICG-PDR measured on day 1 in different causes of ALF including viral hepatitis, acetaminophen (AAP), and non-acetaminophen (NAAP) induced liver injury, ischemic liver injury, and unknown causes. The number of patients in each category is indicated. Using Kruskal-Wallis test, no statistical difference was observed between the different etiological ALF groups. (D) Lowest ICG-PDR measured throughout the study (day 1-7) in different causes of ALF including viral hepatitis, acetaminophen (AAP), and non-acetaminophen (NAAP) induced liver injury, ischemic liver injury, and unknown causes. The number of patients in each category is indicated. Using Kruskal-Wallis test, no statistical difference was observed between the different etiological ALF groups. ROC statistics using ICG-PDR measured day 1 (Figure 3A) revealed an AUC of 0.90 (95% confidence interval, 0.77-1.03) and ROC statistics using lowest ICG-PDR measured in each individual ALF patient (Figure 3B) revealed an AUC of 0.81 (95% confidence interval, 0.64-0.98). An ICG-PDR ≤ 6.3%/min measured on day 1 predicted death or transplantation with a sensitivity of 85.7% (95% confidence interval, 42.0%-99.3%) and a specificity of 88.9% (95% confidence interval, 64.0%-98.0%). The lowest ICG-PDR measured in each individual patient at any timepoint = 5.3%/min predicted death or transplantation with a sensitivity of 85.7% (95% confidence interval, 42.0%-99.3%) and a specificity of 66.7% (95% confidence interval, 41.1%-85.6%). Predictive discrimination of (A) ICG-PDR measured at day 1 of study and (B) the lowest ICG-PDR measured in each ALF patient during the study as determined by receiver operating characteristics (ROC) plot analysis. The ROC analysis indicates the ICG-PDR threshold for the best compromise sensitivity/specificity to predict ALF outcome (AUC, area under the curve; CI, confidence interval). 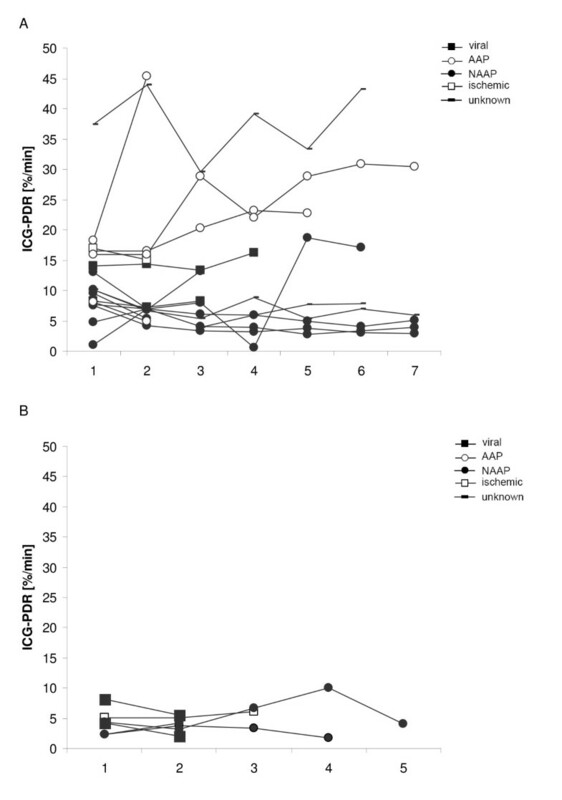 When analyzing correlation of ICG-PDR measured at day 1 with INR, bilirubin, creatinine, AST, ALT, Apache II score, and MELD score, significant correlations were obtained for INR (r = -0.41; P = 0.043), bilirubin (r = -0.53, P = 0.006), and MELD score (r = -0.67; P < 0.001). Based upon the available data, the current prognostic scoring systems have not consistently demonstrated reliable accuracy in predicting outcome from ALF and the subsequent need for liver transplantation . In this study we prospectively evaluated ICG-PDR in predicting outcome in 25 patients with ALF. ICG-PDR measured at day 1 (after inclusion in the study) below 6.3%/min had a sensitivity of 85.7% and a specificity of 88.9% in predicting outcome in ALF patients. 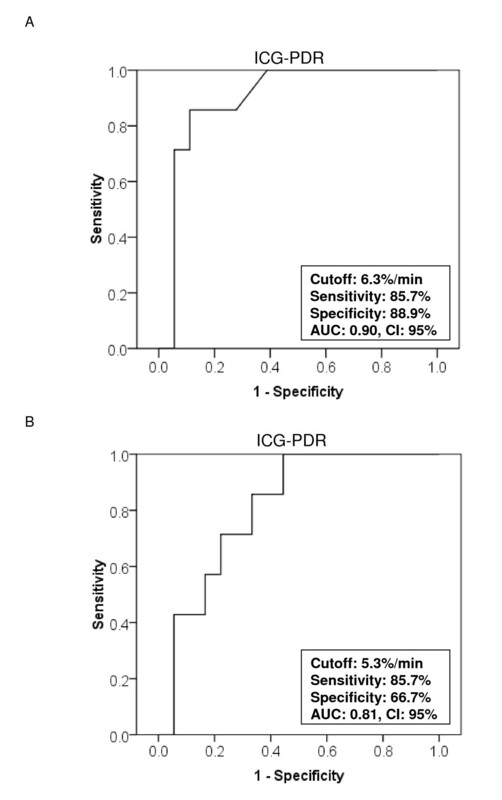 When analyzing the lowest ICG-PDR values obtained in each individual patient during the study period (day 1 to 7 or until liver transplantation, death, or discharge from intensive care unit, respectively) the sensitivity remained high, but specificity was slightly lower. Our results coincide with a previously published retrospective analysis of ICG-PDR in seven patients presenting with acute liver failure . In this report ICG-PDR values greater than 5%/min were a prognostic factor for hepatic recovery. However, although in our cohort the predictive value of ICG-PDR is promising, caution has to be taken with the interpretation of single ICG-PDR measurement as ICG-PDR may vary from day to day (Figure 1). One could speculate that the observed variation of ICG-PDR values may in part be caused by an - to date speculative - additional extrahepatic ICG elimination or decay. This hypothesis is supported by the previously published observation of ICG clearance even in anhepatic patients . Nevertheless, our results suggest that ICG-PDR measured early during the course of ALF is a valuable prognostic marker for predicting outcome of ALF. One advantage is its prognostic value early in the course of ALF. Thus, measurement of ICG-PDR might help to timely identify those patients with ALF who are likely to benefit from liver transplantation. To date the most widely used criteria are the King's college criteria . In a recent meta-analysis, Bailey et al. compared different prognostic criteria used to determine the need for liver transplantation and found that all prognostic models presently available lack sensitivity and may miss patients requiring transplantation. In this meta-analysis King's college criteria performed best, with a sensitivity of 69% and a specificity of 92%. In our study sensitivity and specificity of King's college criteria in predicting outcome in ALF patients were 85.7% and 83.3%, and thus in the range of the results of the studies included in the meta-analysis of Bailey et al. . Compared to the results obtained in the meta-analysis of Bailey et al. the prognostic value of ICG-PDR in our recent study is superior to King's college criteria with respect to its sensitivity and equal with respect to its specificity. However, the evaluation of the performance of King's College criteria in our and other studies must be interpreted with care as fulfilment of the criteria has most likely influenced the clinical decision whether to transplant a patient or not. In addition the number of patients analyzed in our present study is limited. Thus, future studies in larger cohorts will have to follow. Clinical studies in ALF patients are often limited because of heterogeneous aetiologies, the small number of cases, and difficulties in predicting the patient's outcome without transplantation. In our present study predicting the spontaneous outcome of six of the seven patients not recovering spontaneously and receiving liver transplantation can only be assumed fatal. However, as the fatal outcome in these is only an assumption and part may have survived without liver transplantation the calculated ICG-PDR test performances may be inferior to that stated. In general, ICG removal from blood depends on liver blood flow, parenchymal cellular function and biliary excretion [19, 20]. ICG-PDR is a complex measure of both, sinusoidal perfusion as well as hepatic cell membrane function, and thus, reflects a functional reserve of intact hepatocytes which participate in maintained nutritional perfusion . In our study, ICG-PDR allowed early and sensitive detection of spontaneous recovery from ALF, which might be helpful in clinical management. A non-spontaneous recovery from ALF was associated with high ICG retention rates. The advantage of the method used in our study is that ICG-PDR can be measured noninvasively at the bedside by a transcutaneous system even in critically ill patients and results can be obtained within 6-8 minutes . Normal values for ICG-PDR are considered to be over 18%/min. In our study only one patient presenting with ALF had an ICG-PDR in the normal range. ICG is known to be a safe substance, as side effects are very rare (1:40000). Since ICG contains iodine, however, it should not be used in patients with iodine allergy or thyreotoxicosis. ICG-PDG is a valuable dynamic liver function tool to predict outcome in patients suffering from ALF early during its course. Because of the possibility of its user-friendly non-invasive bedside assessment, we suggest to use ICG-PDR together with other clinical variables to monitor progress or reversal of liver failure. The study was supported by a grant from the Else-Kröner-Fresenius Stiftung to C.E. Pulsion Medical Systems AG, Munich, Germany provided the LiMON-Monitor but did not participate in the design and performance of the study nor the analysis and interpretation of the data. UM performed the statistical analysis and drafted the manuscript. OS carried out ICG measurements. WS helped to draft the manuscript. JE conceived of the study and participated in its design. CE conceived of the study, and participated in its design and coordination and helped to draft the manuscript. All authors read and approved the final manuscript.